Google is offering 2GB of Drive storage if you take its security check-up. Did you read that? Google says I did a good job! There’s no such thing as a free lunch, and there’s no such thing as free cloud storage, either. (If you’re not paying for something online, you’re probably the product yourself.) But the cost can be worth it. 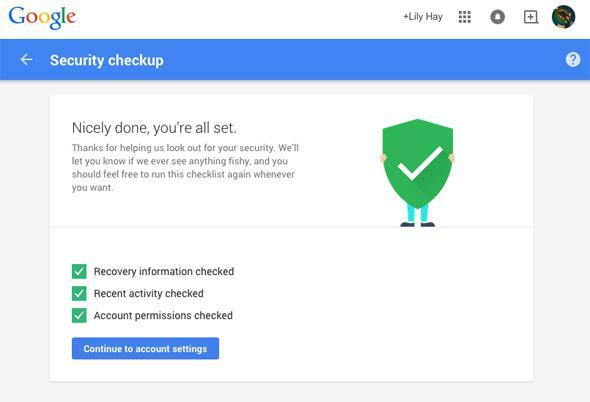 In honor of Tuesday’s Safer Internet Day, Google is using 2GB of additional Drive storage as an incentive to get users to take a security checkup. All you have to do is click through the two-minute survey-style diagnostic between now and Feb. 17, and Google will permanently add the extra storage to your account at the end of February. If you use Google Apps for Work or Apps for Education, though, you’re not eligible for the promotion. The process checks to make sure that Google has good secondary contact information for you if something suspicious happens on your account. Then it shows you your recent sign-in activity to make sure nothing unexpected is going on. And finally it shows you a list of all the apps, services, and devices that have any type of access to your account. Everything is editable as you move through the checkup, so you can make any changes you want. There are a lot of important steps we all need to take to stay secure online, but the checkup is a reasonable start. And it’s always nice to be rewarded for being responsible.